We are going to make an interactive version of the map below, starting with data from three different sources merged using QGIS. We will also see some key differences between data access methods. 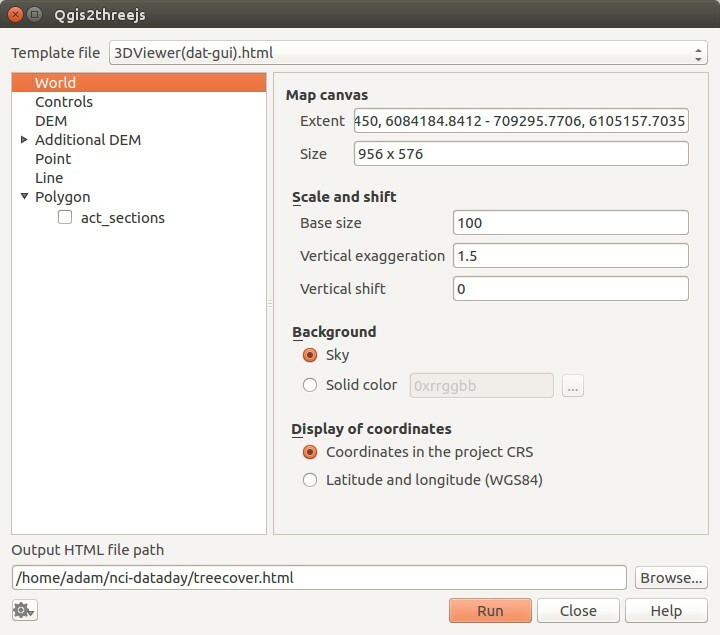 QGIS (Quantum GIS) is an application for geospatial data analysis and visualisation, focussed on 2D (raster and vector) datasets, and wrapped in a straightforward graphical user interface. It can also be used as a Python library, but for this session we use the GUI. I have [insert many other tools] on the VDI - why use QGIS? QGIS can be used on the VDI as a rapid-prototyping tool. If you’ve got all the infrastructure you need available in your project space and don’t need it, that’s great! We hope to demonstrate some ways which QGIS can help you quickly develop shareable, multi-source analyses quickly and simply. We also revise some web service principles. do hillier sections have more or less tree cover than flatter sections? …to hold our finished map. We will use these throughout the session. Note - here, sections are collections of 50 or so individual house blocks. Our elevation and tree cover data are too coarse for individual house blocks - and the vector data file for blocks is massive! As a demonstration, we will acquire these data using a Web Coverage Service (WCS). This will start QGIS - which we’ll use shortly. For now, head to Firefox - we are off to discover some data! Note - we’ve also loaded NCO, which we will get to soon. For topography we need a terrain model in a raster format, e.g. GeoTIFF, which covers Canberra. Shuttle Radar Topography Mission (SRTM) data are a good source of reasonably detailed elevation data held at NCI as NetCDF tiles. Enter this link into a web browser to obtain a GeoTIFF DEM in your default download location (check in ‘downloads’). Rename it to something memorable if you wish, in your qgis_vis_files directory. This results in a subset of the ANU WALD treecover dataset in our VDI desktop - which we can load into QGIS as a raster layer. Here, we demonstrate a method of quickly viewing parts of your output data - even if they are not yet fully QC'ed and need a little massaging to get going. So far we have a bunch of grey things - let’s make them colourful! 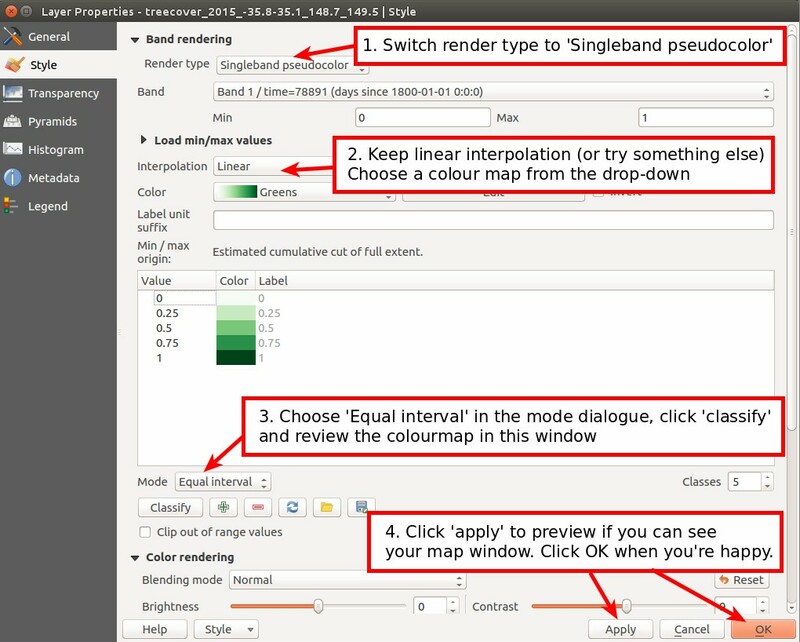 leave interpolation as ‘linear’, and pick a colour palette. Because the data are continuous, a single hue continuous colour palette makes sense. Because it’s vegetation, green also makes sense. Choose what makes sense to you. click ‘classify’ to show the palette in the big window, and apply with with ‘apply’. click ‘close’ to return to your map. How could you automagically save WCS data with sane, memorable names? Why not just use the QGIS OWS browser to grab these data? The QGIS WCS browser and THREDDS don't play well - QGIS attenuates the full THREDDS WCS URL, so it is far more convenient to form a request independently of QGIS. 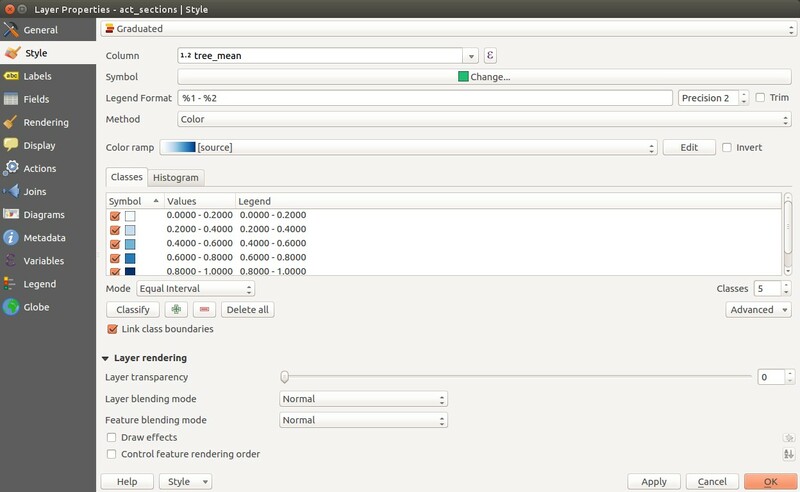 OWS layers can't be used for processing - ie band math, and the visualisation tools we're about to use. If you're keen, do some exploring - we don't know everything about QGIS - surprise us! Why not get these data from the filesystem? Great question! The main reason is that we're demonstrating QGIS as a way to fuse data from manifold sources. Over today and tomorrow you'll see a log examples of how to collect data from the filesystem in manageable chunks - which you could then analyse/visualise using the methods shown here. Demonstrating web coverage services on the VDI shows how you can pull data from many external sources to help interpret your work. 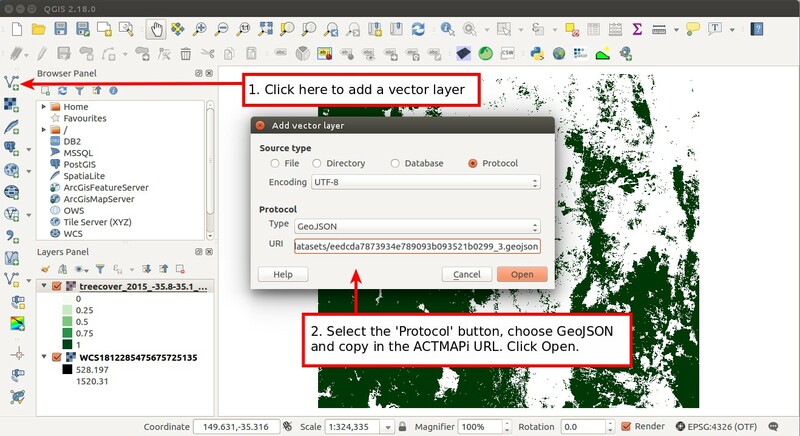 In QGIS, Click ‘add new vector layer’, select the ‘protocol’ radio button, and past the URL in. The layer will load - but like WCS raster data, it can’t be used for analysis. 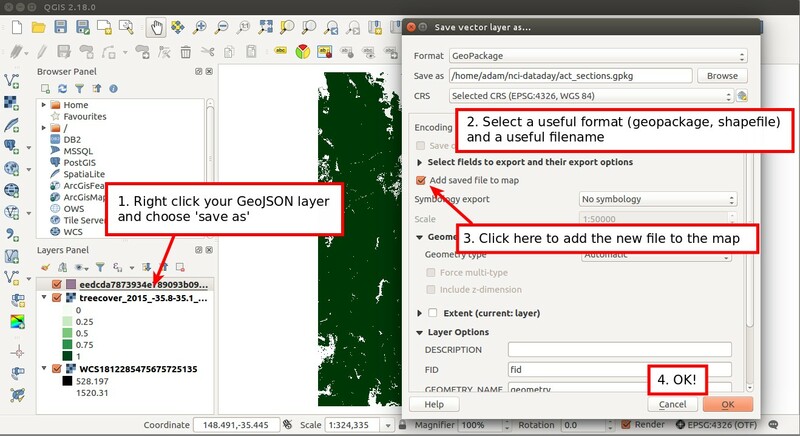 Save it as a Geopackage and reload the layer (delete the GeoJSON layer). Again, your qgis_vis_files directory is a good place. Why would we use a Geopackage? Why not a shapefile? 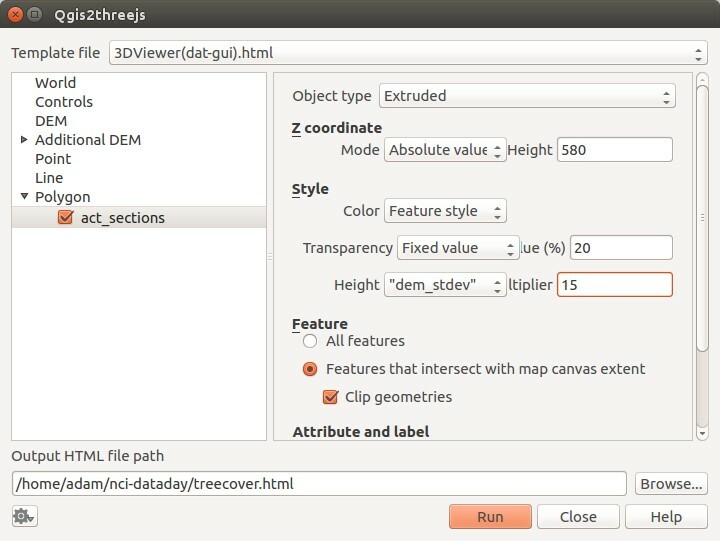 Select the Qgis2threejs plugin and click install. The Zonal Statistics plugin is installed by default but needs activating. Search fit Zonal statistics in the plugin manager, and check the box next to the plugin name. Then click close and you’re done. The mean treecoveer of each section. 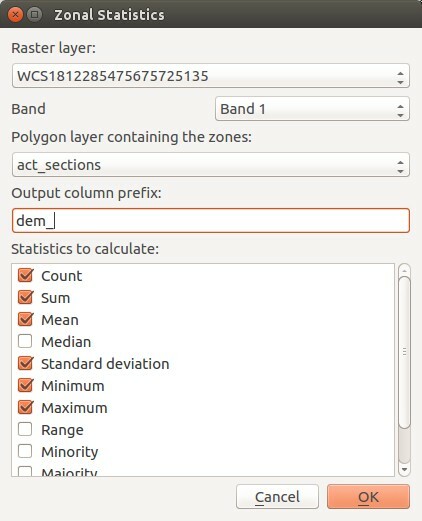 The Zonal statistics plugin collects data from raster layers using polygons in a vector layer, and computes basic statistics for the chunk of the raster layer inside each polygon. As a proxy for section hilliness, we’ll use the standard deviation of elevation in each section polygon. Head to raster -> zonal stats to open the plugin. 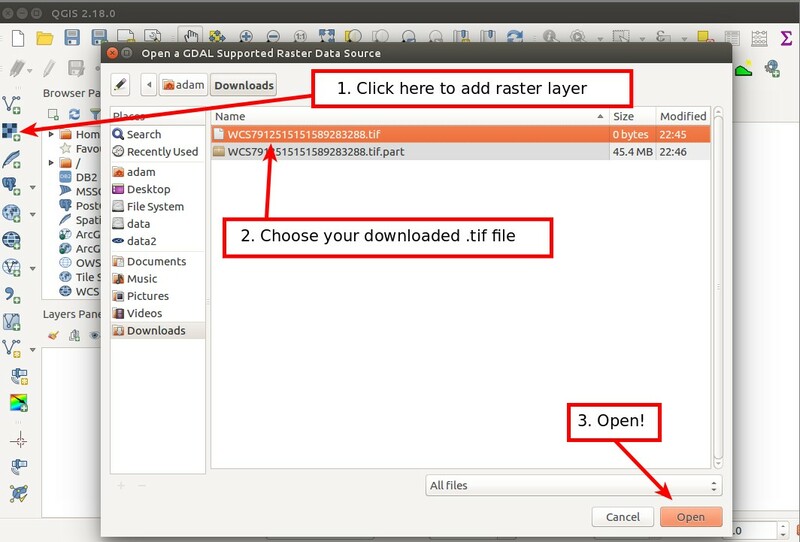 In the zonal statistics plugin dialogue, choose the DEM as the raster layer, and use band 1. Then choose your ACT blocks vector layer. In the statistics to calculate, pick an appropriate set - but include standard deviation - this is our roughness proxy. Add a meaningful prefix to the statistics (e.g. ‘dem_’), so you can find them when you need to use them. QGIS will spend some time calculating stats for each block, and add the output to the vector layer (act_sections) as another attribute column. For tree cover, each grid cell/pixel shows an estimate of tree cover as a percentage of the pixel. As a quick measure we could take the mean of all the pixel values inside a block to get an idea of it’s tree coverage. We avoided styling our vector layer earlier, but now it’s time - since we want to visualise the tree cover in each section. So far we can visualise the tree cover of sections in the ACT - but how can we relate that quickly and easily to section hillines? And how could we visualise results? is a graphical GIS the only way to collect zonal statistics using a vector layer to segment raster data? In this scheme, if hillier blocks have more trees, dark blue blocks will visualise as taller columns. If hiller blocks are less vegetated, light green blocks will visualise as taller columns. Lets test it out! Here we use the second plugin - Qgis2threejs. This renders the current screen to a WebGL map in a .html page using three.js - with some neat data visualisation features. You can open the result as an interactive map in a web browser. Enter ‘MGA 55’ in the ‘filter’ box, then highlight GDA94 /MGA 55 in the ‘coordinate systems of the world…’ box. It should show up in the ‘selected CRS’ panel. You’ll see that everything has warped a touch, and your CRS panel (lower right) reflects your choice. Proj.4 handles all the rest for you! Qgis2threejs attempts to render the whole map window. We want to limit or map to the extents of our DEM - so we can either zoom the map window in so that our region of interest occupies the whole window, or set a clipping polygon in a new vector layer. Here, we zoom in so that our region of interest fills the map window. Head to web -> Qgis2threejs to open the plugin dialogue. Click ‘world’ in the left pane, here we define basic parameters about the map we’re creating. It’s usually prettier to apply some vertical exaggeration in Australia, try between 1.5 and 3. Next click ‘DEM’. 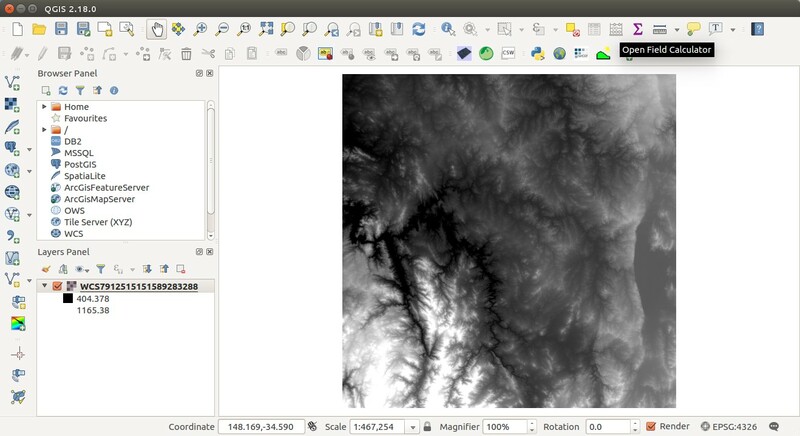 Here you select the SRTM data you grabbed via WCS as the dem to build terrain. 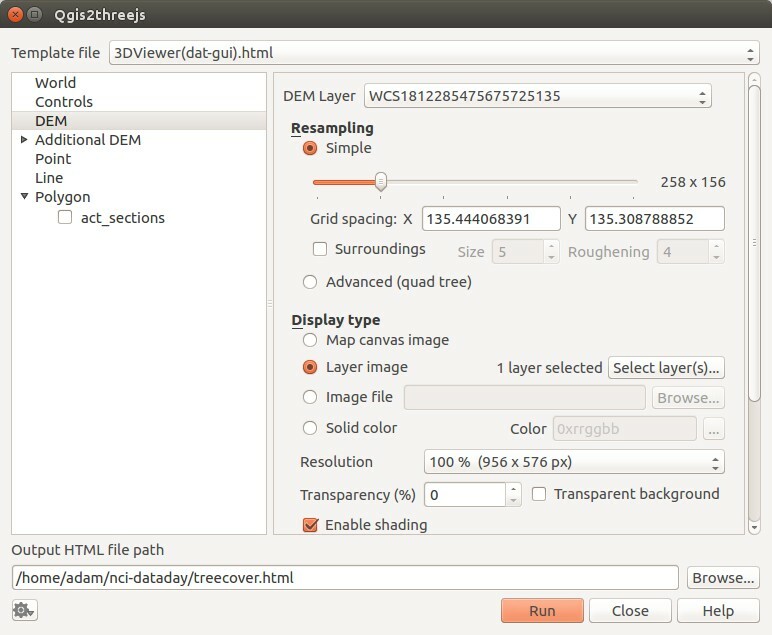 You can set an image to be draped on the DEM - map window view, a specific layer, an image or a plain colour. 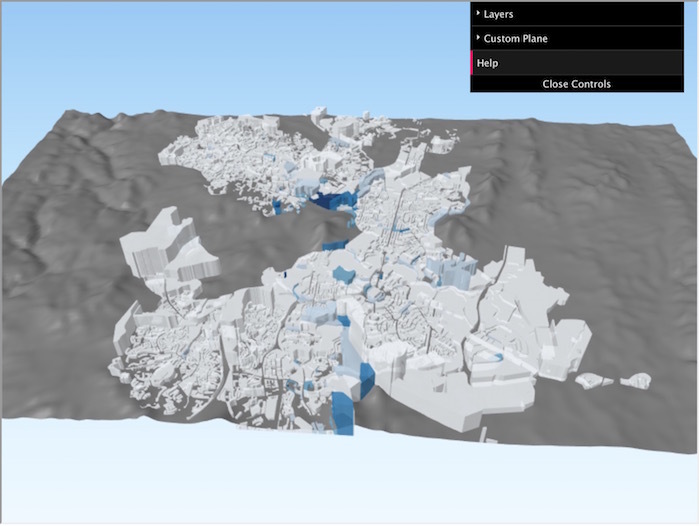 This example uses the DEM layer to colour the terrain map. Also turn shading on to get pretty hillshading. Finally check the radio button next to our ACT sections layer in the left panel. Here we set up some visualisation parameters for our vector layer (which contains the section-level treecover statistics we generated). Set the Z coordinate to’Absolute value’, and enter 580 m. We’re going to compare the heights of extruded polygons, so we should start them all in the same place! Keep the colour as ‘feature style’, set ‘Transparency’ to 20-30 and finally, choose a data source to detemine extruded polygon heights. We finally relate the hilliness of sections to tree cover here - choose dem_stdev, and a multiplier (10 works well in this example). We finally use our qgis_vis_map directory - browse to it at the ‘output html file path’ box and use a memorable name to save your output html file. Then click run. All being well firefox will open and display an interactive map like the one below! See section 13 for links to prebuilt versions hosted at github.io. If the map doesn’t pop up right away navigate to the place you just stored the .html file, and open it in a browser. If hilly blocks have generally more tree cover than flatter blocks, short columns should be lighter shades of blue (in this colour scheme). …but that’s not necesarily what we see! Why not? Create a totally new interactive 3D model using the stack we've just been working with, and give us a URL to see your work! Visualise the same result a different way - do we really need qgis2threejs? What are some other ways to share QGIS projects? ...are there others? What was yours? You could also try rasterstats: https://github.com/perrygeo/python-rasterstats - any other suggestions? For simple projects with CCBY4 data, the QGIS cloud is one way of sharing your results. Another is a Jupyter notebook hosted on github as a gist, a notebook, or as a github.io page. What was your approach? 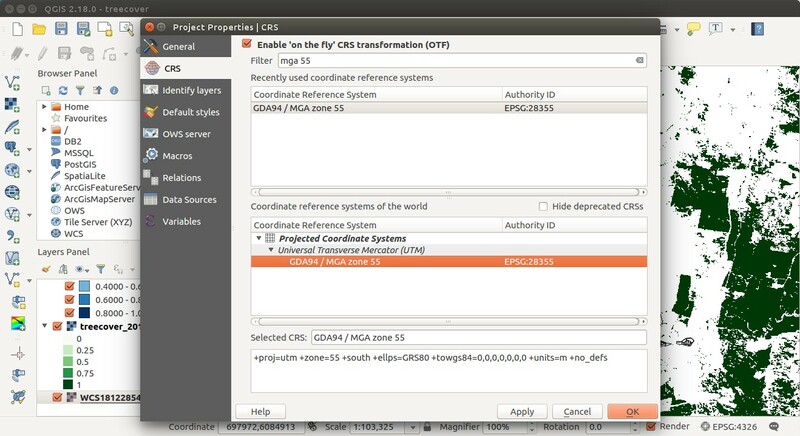 Here is a great tutorial on netCDF and QGIS: http://www.ggiuliani.ch/download/netcdf_qgis_GG.pdf - covering a lot more than we did here, and useful for working with data directly on the VDI filesystem. Also, inspect the result of your work - what is Three.js doing? What can you apply from this example to other work? The Qgis2threejs plugin can only add so much - how could you render additional datasets in the same map? </div> ## Summary Here we: - Used a graphical GIS available on the VDI - Used OGC web services available at NCI - Demonstrated pulling data from external web services - Demonstrated shaping data in the filesystem for merging with web service data - Used these data to perform a basic analysis - Learned one method of visualising and sharing results Thanks! Discussion and suggestions welcome.